TSC TTP-644M - Printer, 600 DPI, Thermal transfer, 4 ips, Ethernet, 32MB Dram, 8MB Flash, 6 inch LCD Display, USB, Serial, Parallel, 600 Meter Ribbons, TSPL-EZ Language. 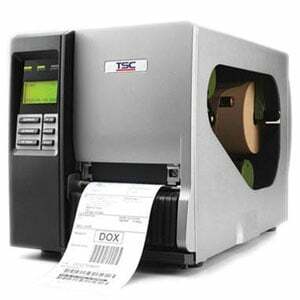 Offering 600 dpi resolution, the TSC TTP-644M die-cast aluminum label printer is designed to meet the most demanding bar coding and identification needs. With its durable design and high-resolution capability, the TTP-644M is ideal for mission-critical printing applications either on-demand or batch. The TTP-644M operates at speeds up to 4 ips. Standard features include internal Ethernet, USB 2.0 and PS/2 keyboard connectivity, 32 MB SDRAM, 8 MB FLASH memory, and an SD memory-card slot for adding up to 4 GB of additional FLASH storage. The TTP-644M accommodates ribbons up to 600-meters long, along with a full 8.2-inch outer diameter media roll. An optional peel-off kit includes an internal rewinder and a label peel-and-present sensor. The TSC 99-047A005-00LF is also known as TSC-99047A00500LF	or 99047A00500LF	.